Hi friends, how are you? We're enjoying some delightful weather this week, in the 70s! Yesterday morning it was in late 40s when I got up. Definitely fall weather. Chatting with my mother-in-law, we can hardly believe it's already halfway through September for pete's sake. What a year it's been for us. One of the things I've been thinking about lately is how back in the day we'd drive for hours to check out quilt shops and see what was new. You couldn't see everything under the sun on the internet like you can now, so you'd have to drive all over. We'd somehow get wind of a new quilt shop opening and we'd make a plan of visiting it as soon as it opened, and hitting all the shops along the way. USING PAPER MAPS! Sometimes MapQuest or whatever mapping software was available at the time. Martingale put out books featuring quilt shops and I loved it. I dreamed of visiting places. Plan trips around shops, it was a cool thing. Now it doesn't seem like people do that quite as much. Or maybe it's just me? But one shop I've wanted to see for a while is Temecula Quilt Company. I'd seen those cute little ruler boxes with their name on them. My friend Joyce told me about their sew alongs on the blog, and just the photos.. well they're captivating! 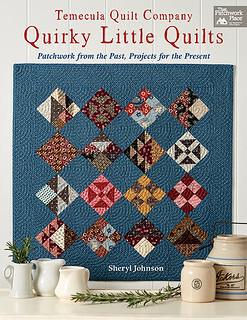 All this brings me to the one of the latest e-books that Martingale shared with me, Temecula Quilt Company Quirky Little Quilts. If you like sweet little quilts get ready to fall in love. 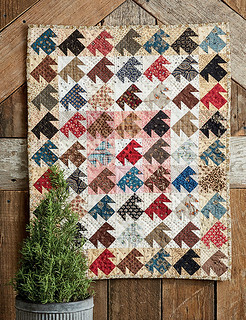 So many adorable projects, it brings me back to my Civil War reproduction days. All these photos are from Martingale. I picked my two favorites to share with you, but you can go check out the rest of the quilts here. I love this flower shape, this quilt is Petite Posies. I know it's an old block from way-back-when and that's exactly why I like it. 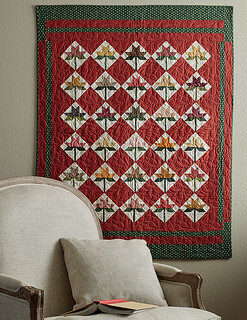 I still feel drawn to these quilts even though I mainly sew with the brighter PMK palette. And really wouldn't all quilts work in whatever colors you picked? My absolute favorite in the book is T is for Temecula. I love that block and I love the way Sheryl has used the changing background colors to give this a little extra sparkle. The whole book is totally charming. Lots of photographs of vignette's which I LOVE. It makes the book so special to me, pretty to look at even if you don't stitch a quilt. Entertainment while reading and then later while sewing. Double the fun. Beautiful and cute quilts in there. Yes, I remember paper maps, and how proud I was, that I could 'read' them :)! Touring around quilt shops, using a map, sounds really fun. Last week, we too had 'cold' weather, and almost forgot our super hot summer - today it is super hot and humid again! I love those ruler boxes. Got mine at Village Dry Goods in Brigham City. Now I want to see Temecula! I do miss the days of hunting down tucked away fabric shops. I also miss that that people used and traded fabric they had...that it wasn't a new trendy design every month. It seemed that there was more originality, uniqueness. Perhaps it's just me getting old. Sadly, so many brick and mortar shops can remain open. Well I slapped a whole lotta sunshine down on this post!